In this line of work, I get to tour a lot of collision repair shops. Some of those shops are dealership body shops that are either under the same roof or located in the same lot as the dealership. One thing that always surprises me is when I find that the service department, the sales department, and the body shop do not communicate with each other as a whole. In other industries, this situation is referred to as “siloed” where departments are in silos and either afraid to or unwilling to work with each other. Just recently, I was at a shop in Pennsylvania and I overheard a customer who was getting an estimate for a new side mirror as a result of a sideswipe. What struck me is that the customer was there because the insurance company had sent her there, not the service department, despite her having just had the car serviced in preparation for a Pennsylvania safety inspection. Had the insurance company sent this person to another shop, the dealership would have lost out on some decent revenue. If I was the dealership owner, I would be furious. This situation plays out every day in dealerships all over the country. I have even worked with shops that are not allowed to email blast their sales and service customer databases. Does this sound like your organization? It doesn’t have to be this way. 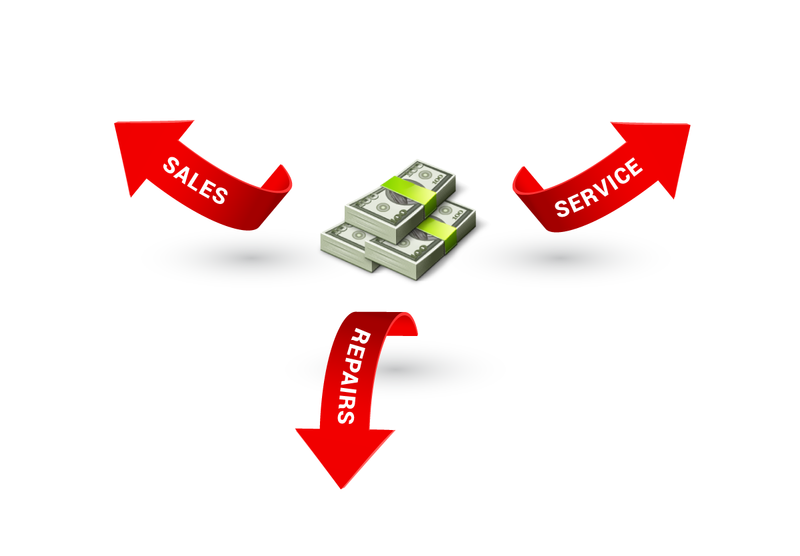 Today, we are going to uncover some ideas to put an end to lost revenue in your service departments. The first step is to realize that it is not your customer’s duty to remember that you also have a body shop or a service department. These should be kept top-of-mind with all customer contact points. For every sales piece you create to drive new car sales, you should think about how this could also drive revenue for the other departments. If you have a dealership marketing team, a service department marketing team, and a body shop marketing team, all these people should be working together to generate leads for the dealership as a whole. In fact, you may consider putting them all in the same location in adjacent offices or cubicles so that they can easily work together. Each car that is leased should be a lead passed over to the service department and the body shop. Some leases require the use of OEM collision repair parts. And most lease vehicles will require some reconditioning prior to trade in. Your body shop should have access to all leased vehicles who are due for trade-in six months prior to the trade in date in order to reach out and offer deals on trade in preparation. Money always talks. Consider implementing a cash bonus referral program for all work referred among departments. This should not be limited just to managers, empower your technicians to make recommendations. Vehicles declared a total loss should be an easy referral to sales, but service should routinely scan vehicles for body shop upsell work. Train your staff to pay better attention to the customers coming into the service bays. Take notice if they have any family lifestyle changes, like a new baby, a new driver, or upcoming graduation and discuss options that might help address the need for a new vehicle. Your service drive is an excellent business center to support your dealership’s CPO and new retail programs. Stay engaged with your customers to maintain their brand and dealership loyalty. Consider having a body shop estimator work out of the service department to write complimentary estimates on any potential work they see in the repair bays. You don’t even need to ask the customer if they want an estimate, simply provide it along with the service work estimate and offer to set a time to have the car in for the repair. Something as simple as that written estimate attached to a postcard advertisement for the body shop could generate additional revenues. Another option is to include this in a text message if your service department uses a texting service to update customers. Text a link to an estimate for the body shop while the car is still in the service bay to make the transaction smoother. For example, if the car has to stay in service to receive parts, now would be a great opportunity to take care of those dents, scratches or quick bumper repair. Texting can also be a great way for customers to communicate with service managers, get answers to questions, and schedule appointments. However, we caution dealers against advising staff communicate with customers on their personal cell phone devices without the use of a texting platform that tracks conversations, manages opt-ins and opt-outs, and integrates into a dealer’s CRM tool. Another suggestion is to host customer car care clinics, which includes all makes and models, and offer free vehicle inspections, appraisals on vehicle resale costs, or reconditioning costs. This positions your business as your customers’ advocate while giving you the opportunity to generate new business and goodwill. We hope these tips have given you some ideas on how to stop the leak of potential profits that you may not even realize are slipping past your Dealership, as we continue our mission to make 2018 the Year of Growth for your business.